Sometimes you can do more harm than good. As you walk in the warm spring sun, your phone tucked into your pocket (who can see the screen in this glorious daylight, anyway? ), you notice an unexpected chirp coming from the hot pavement. 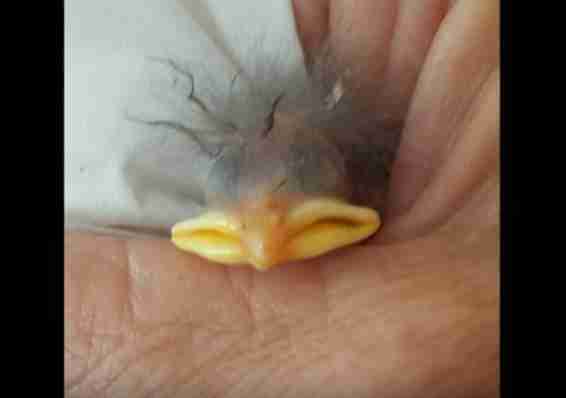 You look down, and see a baby bird. He seems parched there on the pavement. Raw-skinned and featherless. Vulnerable and alone. As humans, we're inclined to save this tiny life After all, we're talking about a baby here. But wait. Didn't your fourth-grade teacher tell you never to touch a baby bird? And what can you do for that errant infant anyway? Will your local animal control office respond to a call for one weak and wrinkled little bird who already appears not very long for the world? Well, it turns out there's a lot we can do to make sure these seeming orphans get a chance at life. Peter Helmer, a specialist in avian veterinary medicine at BluePearl Veterinary Partners, shared a few tips with The Dodo. For one thing, consider the underrated act of not acting at all. As with many animals, mother birds will occasionally leave their babies alone while they run to do some errands. Namely, gathering food to fill those tiny mouths back in the nest. "The animal's parents will do the best job at raising the baby compared to a wildlife rehabilitation facility or veterinarian," Helmer notes. "Unless the animal is injured, it is best to leave it alone and let nature take its course." That's all well and good if we come across a baby alone in a nest, a tree or even in a stretch of grass. But on the sidewalk? Our front porch? That may call for a little human intervention. 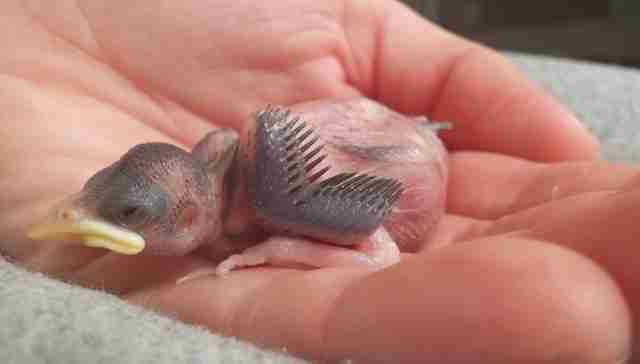 Try wrapping the bird in a towel and carrying this little bundle to a nearby tree or shade. Mothers, as you may already know, have a genius for knowing exactly where their children are - as long as you don't take them too far from where they were found. And, yes, the idea that mothers abandon babies touched by humans is fiction. 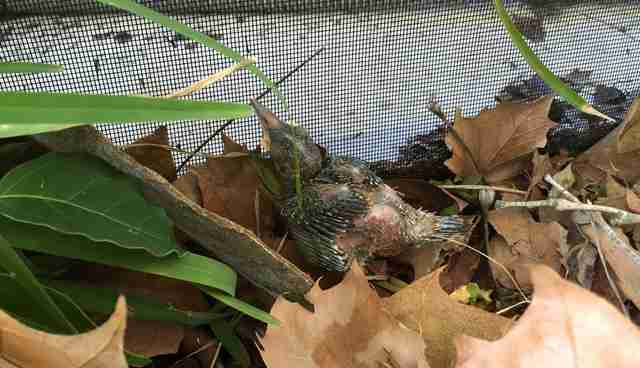 "It is a myth that touching a baby bird will orphan it – birds do not have scent glands," Rob Halpin of MSPCA-Angell tells The Dodo. Although you'll still want to be extremely tender handling the baby for obvious reasons. The idea is to get them to a safe place - sheltered from the searing sun and, of course, beyond the clutches of dogs and cats who may stumble upon them. Keep in mind, animals generally have no idea what a helping hand looks like. Often, they may see it as a grasping menace. They may try to peck or scratch. Once you've gotten this precious cargo to a safe spot, lay a few blades of grass over him. That way, you can check up on the baby bird in 12 or 24 hours. If the grass has been displaced, it's likely mom is back on the scene and in charge. Of course, a badly injured baby will need more than just a fresh patch of shade. Ideally you should take him to a wildlife center. But if you can't find one near you, Helmer recommends taking him to the nearest veterinary hospital - again using a towel or a crate, to keep the baby from bouncing around in the car. It's important to note that injured babies won't eat or drink. The key here is to get them medical attention ASAP. Let the animal hospital take care of the tiny patient. 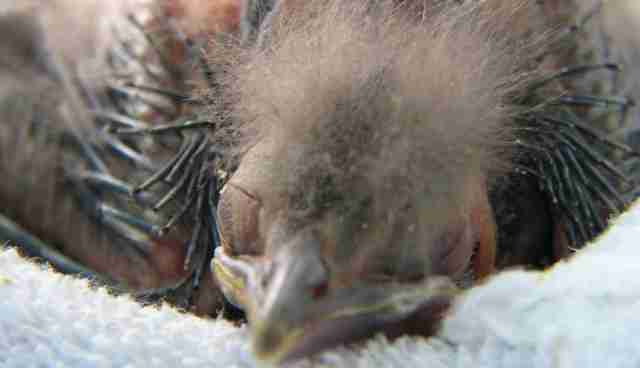 Once baby's better, staff will likely contact a local wildlife center for rehabilitation. Then take that helping hand of yours - and give yourself a pat on the back.